7 Feb 2019, 12:02 a.m.
We are delighted to announce that the CQC has rated Gloucestershire Hospitals NHS Foundation Trust (GHNHSFT) as ‘GOOD’ overall, following a comprehensive inspection of services last autumn. 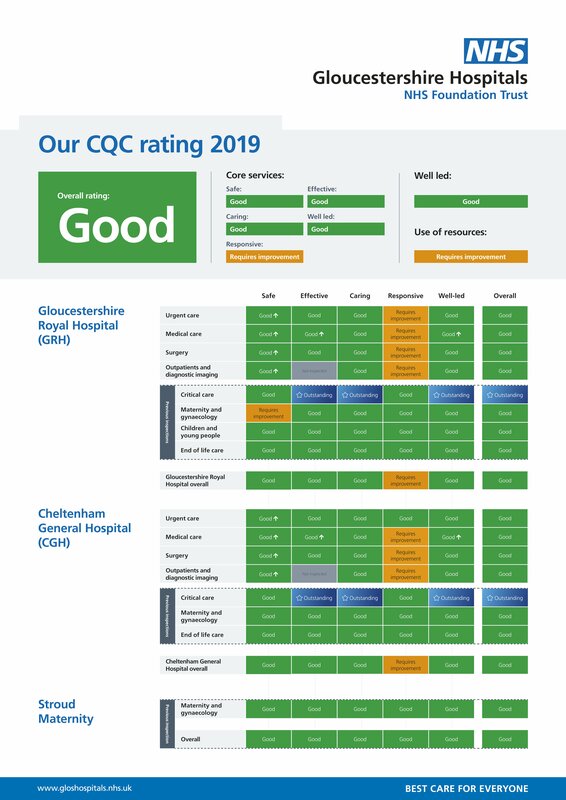 The rating demonstrates the huge strides made at Gloucestershire Royal and Cheltenham General Hospitals in delivering high quality care to patients. Stroud Maternity Unit had been rated ‘good’ in a previous inspection and maintains that status. The inspection shows that 90.5% of services are now rated ‘good’ or ‘outstanding’ compared to 72.5% at the last inspection, reflecting the continuing positive trend of improvements in care. No service was rated as inadequate. The Well-led Review also resulted in a ‘good’ rating, demonstrating the quality of leadership across all levels of the Trust. Unsurprisingly given the recent financial status, the Trust was rated as ‘requires improvement’ for Use of Resources, however, the positive progress being made in managing the Trust’s finances was also recognised as demonstrated by the Trust coming out of financial special measures in November. Positively, the CQC inspectors rated our services as safe and we were judged to be caring in all areas of service. Areas of outstanding practice featured in the report included a culture in which quality improvement and innovation was embedded; special praise was given to the quality of care to patients with a Learning Disability. Recent changes to service provision between GRH and CGH, such as the trauma and orthopaedic pilot, was commended, as were this year’s winter plans and changes to urgent and unscheduled care services (A&E) at GRH. Of particular importance is the residual ‘requires improvement’ rating for the responsiveness of our services – a reflection of the long waiting times experienced by some patients. This is an area that is achieving huge focus in the Trust and we are confident that our plans to improve waiting times will improve significantly. This has been demonstrated most recently with the achievement of the two week cancer waiting time standard (for the first time in more than two years). The inspectors’ insights provide a valuable opportunity to further improve services for patients and will be a tremendous source of motivation for our staff to aim even higher. We want our ‘GOOD’ rating to be a stepping stone on our journey to an ‘OUTSTANDING’ rating at our next inspection, expected to be in three years’ time. The best organisations are continuously striving to improve and our focus will remain in achieving this outcome for our patients in Gloucestershire. To view the full report and more information visit cqc.org.uk and search for GHNHSFT, or the report is available here.